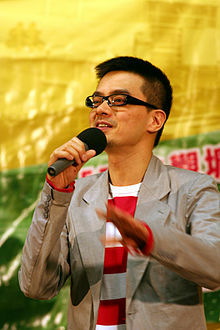 Anthony Wong Yiu-ming (Chinese: 黃耀明; born 16 June 1962) is a Hong Kong singer and record producer. He rose to prominence as the vocalist for Cantopop duo Tat Ming Pair during the 1980s. Wong is the director for music production company People Mountain People Sea. Wong began his career as a DJ at Commercial Radio Hong Kong in 1984. In the following year, he answered a singer-wanted advertisement in a music magazine posted by Tats Lau. They then formed the group Tat Ming Pair, which was later signed by Polygram. After the group disbanded in 1990, Wong continued as a solo singer and later as a producer. In the mid 90s, he reached the peak of his musical career with songs like '’Blow Up'’ (春光乍洩), 每日一禁果 (literally "A Forbidden Fruit-Once a Day"). In 1999, he founded the music production company People Mountain People Sea with a group of artists and musicians in Hong Kong. The company produced and published albums not only for high-profiled Pop singers like Leslie Cheung, Faye Wong, Sandy Lam, Eason Chan, Nicholas Tse and Miriam Yeung, but also published works for other relatively "alternative/ experimental" singers, composers, bands and groups, such as at17 and PixelToy. On 7 July 2007, Wong performed at the Chinese leg of Live Earth in Shanghai. Wong had been noted in the past as "deliberately ambiguous – or better: opaque – about his sexual identity". Following the conclusion of his concert series at the Hong Kong Coliseum in April 2012, Wong publicly came out as gay, stating "People don't need to guess whether or not I'm a tongzhi (同志) anymore...I'm saying, I'm gay. I'm a homosexual. G-A-Y." ^ Jeroen de Kloet -China With a Cut: Globalisation, Urban Youth and Popular Music 2010 – Page 136 "Anthony Wong remains deliberately ambiguous – or better: opaque – about his sexual identity, but incorporates clearly homosexual themes. Such themes are never rendered fixed, but instead are always open to negotiation, redefinition and ..."
^ Chen, Te-Ping (25 April 2012). "Pop Star's Stadium-Style Coming Out". Wall Street Journal China. Retrieved 25 April 2012. This page was last edited on 1 April 2019, at 00:03 (UTC).